The nave and chancel arch are mid-C11 with a blocked C13 north arcade. The tower is C14 and the chancel was rebuilt then. There are good C17 fittings. Unusually, the present place-name derives from the dedication of the church, though it has not always had this dedication and the original name for the area, found in Domesday Book (13,8) and still sometimes found, was Annington. A church is mentioned there, but between the C11 and the C15 the dedication was to St Peter de Vetere Ponte [of the old bridge], though there is little doubt that that to the Saxon St Botolph is the original (VCH 6 (1) p199), not least because he was particularly associated with river crossings (R Morris p219). 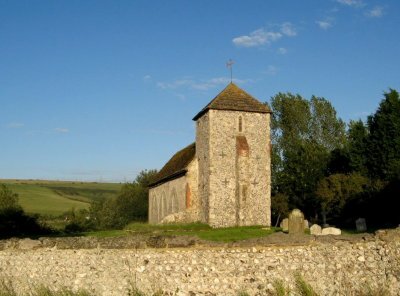 The village was an important port on the lower Adur until the sea receded after about 1350 (VCH ibid) and it became impoverished, so that the parish was united with Bramber in 1526. The tall, narrow mid-C11 nave must belong to the church mentioned in Domesday Book. It has relatively thin walls (2ft 8in) and a round-headed south west window, set high up, which has been repaired in cement. 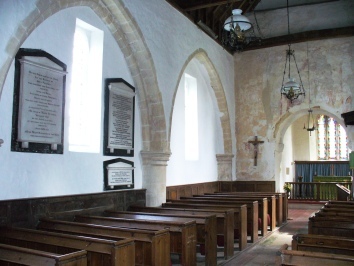 The chancel arch of the same date is low in proportion to the nave. On the soffit of its otherwise plain round head is a thick roll-moulding, resting on corbels roughly chipped to imitate leaves, a rustic version of the Corinthian capital. The south respond has been renewed in brick and the north one cut away. Dominic Tweddle suggests there were originally shafts, with the corbels as capitals (Inventory p126). 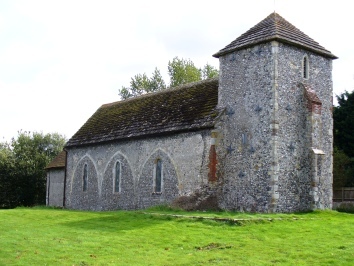 The earliest evidence of late C12 and C13 alterations is a round-headed window east of the south porch, appreciably larger than the C11 one and with a slightly pointed rere-arch. Soon after, a north aisle was added with a three-bay arcade with round piers and moulded abaci. The heads of the two western arches have two chamfers, contrasting with the single one on that nearest the chancel arch, which was probably built first, though all have the same elegantly curled stops. The aisle has gone and the arcade outside is only an outline in the wall. Each blocked arch contains a round-headed lancet, possibly reset from the aisle; the easternmost has a trefoiled head. The foundations of the end walls are visible. 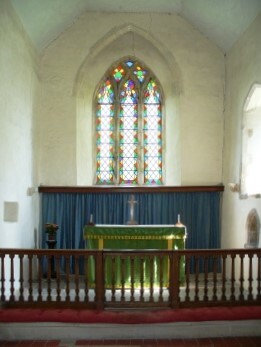 The chancel was rebuilt in the early C14, when the tower was also built. This has a single buttress in the centre of the west wall, one cinquefoiled opening and a low cap, covered in Horsham slabs like the nave. Without an aisle it seems disproportionately wide. Inside, it is entered by a tall doorway, which has a round head that is not a C11 survival and may be C17 (see below). 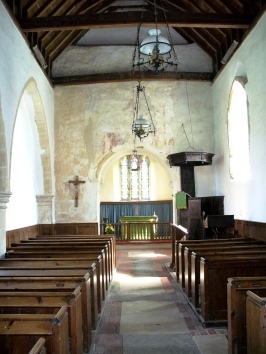 The chancel is short and may retain some walling from its predecessor, though all detail is C14. Apart from a plain north lowside, there are trefoiled lancets to the south (with another lowside) and one replaced the C12 window by the porch. The three-light east window has cusped intersecting tracery, only partly renewed. There were no further alterations, probably because Botolphs was in decline, until 1630. The south door bears this date and also the churchwardens’ initials. A square south opening in the tower and the porch, both of brick, and also, as noted above, the interior entrance to the tower may be of this date, together with the south doorway. W H Godfrey assumed that the aisle was removed then (1 p254), but there is a reference to it still standing but in bad condition in 1776 (VCH ibid). If so, it was removed shortly after, as it is missing on the Sharpe Collection drawing of 1802. C19 changes are poorly documented, though work included a new nave roof, but not the plastered chancel one, the date of which cannot be guessed. The interior was little altered. 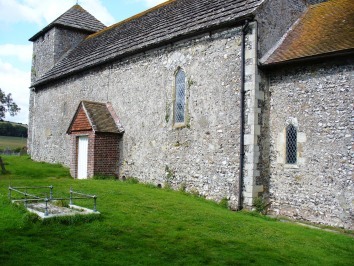 More recently, the church has been part of a united parish with Upper Beeding and Bramber, but was the least used of the three churches. Redundancy was first threatened in 1984, but not until February 2013 was the question finally decided. A major contributing factor was the need for extensive structural work both to the roof and cracks caused by subsidence. 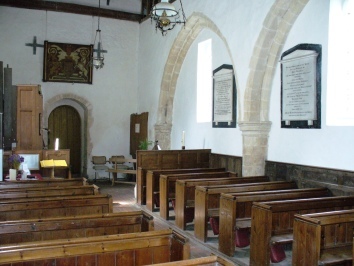 The church was vested in the Churches Conservation Trust, which has undertaken the necessary repairs and apart from remaining open to visitors, it is in regular use by the parish for services. 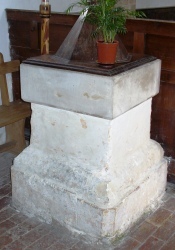 Aumbry: (Chancel) Oblong and probably C14. Brackets: (Side-walls of chancel) Two for images. Font: The simple square bowl has been renewed and appears to have been made out of more than one piece of stone. The base and stem are of plastered brick and the whole may date from the C17 alterations, though A K Walker (p126) sees it as early. Paintings: Traces found in c1932 around the chancel arch (SAC 73 p209) were thought to be from a Doom, including St John and the Virgin Mary, with a bishop, possibly St Peter. Only a few reddish patches are now visible, which are impossible to date, though it has been suggested (NFSHCT Newsletter 2013 p4) that the paintings were related to those at nearby Coombes. If that were so the paintings here might belong to the so-called ‘Lewes group‘, so their condition is particularly frustrating. Piscina: (Chancel) Pointed and hollow-chamfered and probably C14. 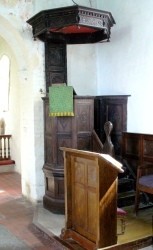 Pulpit: This almost certainly dates from 1630 and retains its tester. It was formerly painted blue (Mee p50). Royal Arms: (West wall of nave) Painted arms of Charles II. Wainscot: (Nave) Some is decorated like the panelling of the pulpit, so this is probably also of 1630. 1. My thanks to Richard Standing for all but the first photograph. 2. The first photograph is similarly kindly provided by Josie Campbell. 3. My thanks to Will Pilfold for information about the redundancy of the church.